Following on from our blog post of a few days ago ["27-Mar-14: Shouldn't this creative approach to terrorism get a little more exposure? "], here's a little more about Saudi Arabia's (ahem) contribution to the global struggle against the terrorists. "participating in hostilities outside the kingdom" with prison sentences of between three and 20 years... Article one of the new provisions defines terrorism as "calling for atheist thought in any form, or calling into question the fundamentals of the Islamic religion on which this country is based". With President Barack Obama having paid an official visit to Saudi Arabia this past weekend, it's fair to assume the hyper-analytic, politically-sensitive mainstream media would have paid pretty close attention to what it must be like to live in a state where the ruler can unilaterally proclaim into the law-books a criminal provision that makes an act of terror out of "calling into question the fundamentals of the Islamic religion on which this country is based". Fair to assume - but unfortunately not so accurate. Soothing Saudi angst was the main aim of Mr Obama's visit, and in this regard it will have been at least a partial success. 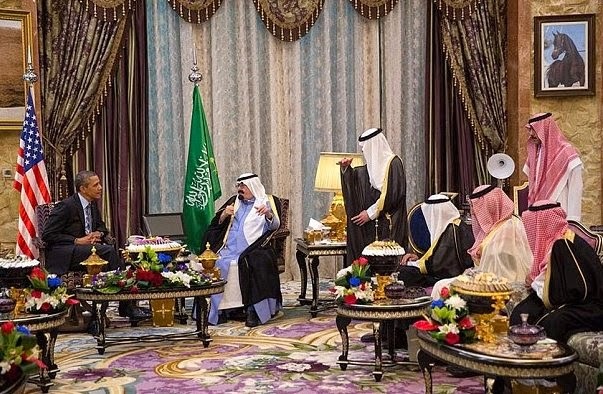 Mr Obama was fulsome in his comments about the two countries' 80‑year relationship, which he described as "strong", and he avoided antagonising the Saudi leadership by bringing up the kingdom's poor human rights record... It is not clear if the two leaders talked about the attempts by the US secretary of state, John Kerry, to energise the Middle East peace process between Israel and the Palestinians. The issue is not high up Saudi Arabia's list of priorities... The Obama administration is already considering the impact that a new Saudi leader would have on the bilateral relationship... Mr Obama's visit may become the prelude to a bigger charm offensive once King Abdullah's successors ascend to the throne. For us, that's the take-away line. The country most closely identified with the 9/11 terrorists gets a flying visit from the world's most powerful political figure because America's policy makers see themselves in a charm offensive directed at a regime that calls its atheists terrorists. We're not sure about how much charm it generated. But offensive? Surely.